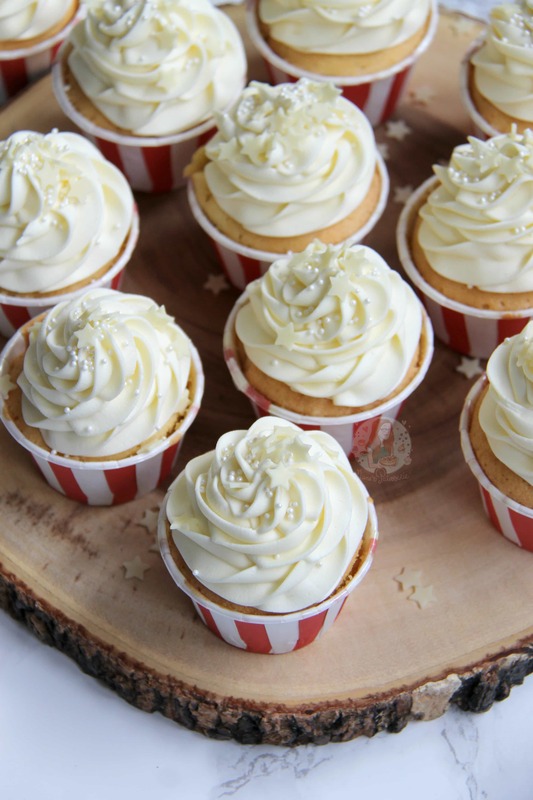 Light & Fluffy Cupcakes with White Chocolate Chips, White Chocolate Buttercream, and sprinkles. 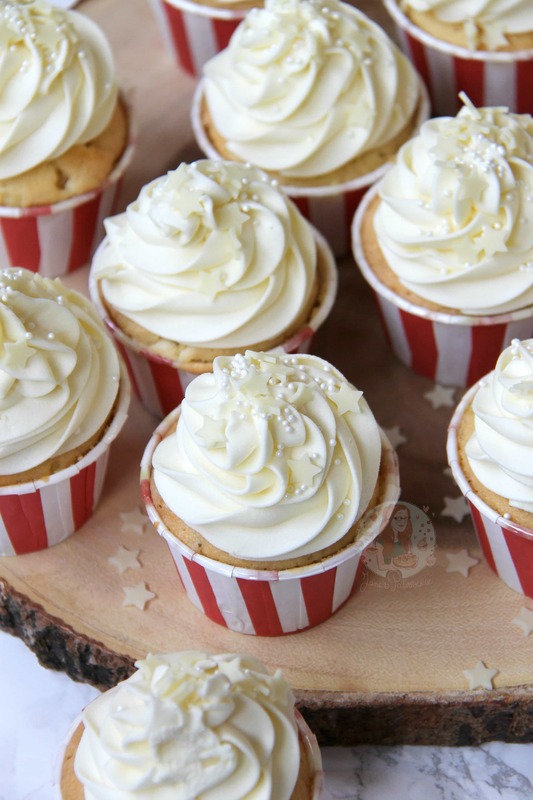 HEAVENLY White Chocolate Cupcakes! So as its getting towards Valentines, I thought I would post something delicious and tempting for you all. 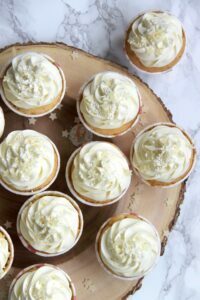 Whether you want to make a batch entirely for you and your loved one, or for you and your friends to enjoy, or even just for your family, you will LOVE these. WHITE. CHOCOLATE. CUPCAKES. Oh my days, its heavenly. Based around my Triple Chocolate Cupcakes, these are heavenly. I wasn’t really sure where to start with this recipe, as I didn’t know if I wanted to put melted chocolate into the batter, or just chocolate chips. I therefore did several test batches of this, and I personally prefer the chocolate chips. They sort of create little pockets of deliciousness that you bite into once the cupcakes are baked and ohhh it tastes so good! Kinda like my White Chocolate & Pistachio Cake! 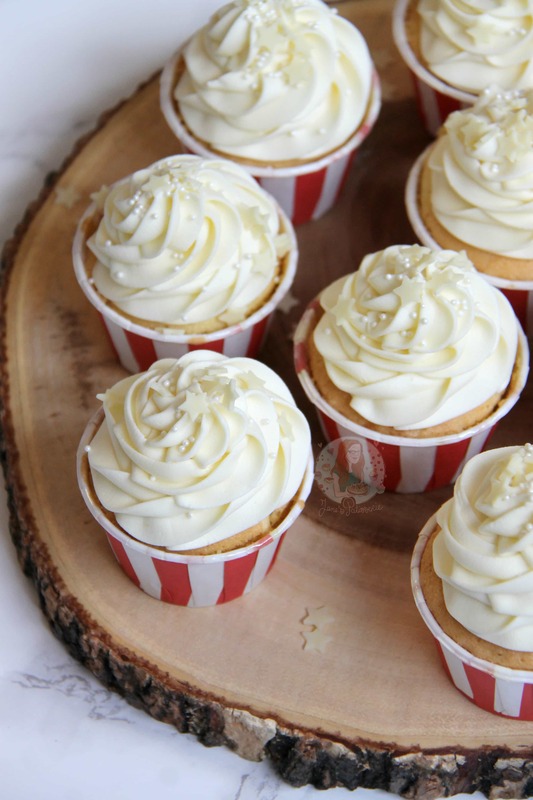 I bought these utterly gorgeous little Iced Jems Baking Cups as I am obsessed with them. I bought these particular ones a little while ago so I’m not sure if these particular ones are still available, but so many other ones are! They are amazing as you can put the cups onto a flat tray rather than in a muffin case, so if you do have a little mixture left over (like I did in this one, I made 13 cupcakes) you can still fit them onto the same shelf in the oven! When you go to eat the cupcake, the case itself pulls out and ends up being almost its own little plate! I can’t get over them. They’re amazing and so cute. Buy them HERE! I honestly adored these cupcakes, and so did my taste testers. HOWEVER, the one who loved them the most was my cake-hating boyfriend. I was honestly so surprised! He turned down a YumYum for another one of my cupcakes! I finally feel like I have concurred his cupcake/cake hating vibe with these deeeeeelicious cupcakes! I hope you love these as much as he and I did! Enjoy! Heat your oven to 180C/160 Fan/350F and line a cupcake/muffin tin with 12 Large cupcakes cases/Muffin Cases. Or put your Iced Jems Baking Cups onto a flat tray! With a stand mixer – Beat the butter with the caster sugar until light and fluffy – Combine the eggs and self-raising flour with the butter/sugar mix until well combined. It won’t take too long to mix! Fold through the White Chocolate Chips until even! Spoon the mix into the cupcake cases evenly and bake in the oven for 18-20 minutes or until a skewer poked into one of the cakes comes out clean and they are springy to touch – leave them to cool fully on a wire rack. 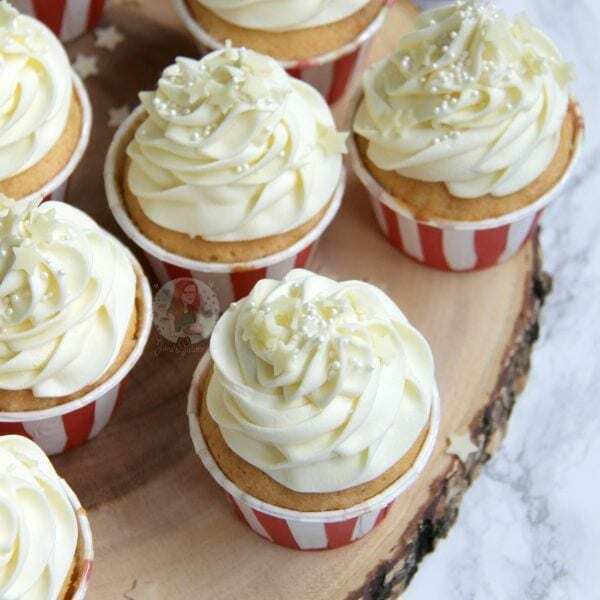 To make the White Chocolate Buttercream – Melt the white chocolate in a heatproof bowl over a pan of simmering water, or in the microwave in short bursts – Leave to cool on the side for 10 minutes. Then, fold through the cooled and melted white chocolate – if its still really stiff, then add in a little milk/boiling water to loosen it and make it smooth. To decorate the Cupcakes – I used a Medium 2D closed star tip to decorate my cakes but you can do whatever you like! Once iced, sprinkle with your decorations and gobble them all up! The White Chocolate really should be cooled before adding into the buttercream, if not it might heat the mixture too much and it’ll go runny/split. You obviously change the white chocolate in this mix into Milk Chocolate, or even Dark chocolate if you prefer them! These cupcakes will last in an airtight container for 3 days at room temperature! Find my other Cupcake & Chocolate Recipes on my Recipes Page! Older Next post: Millionaires Flapjacks! Newer Previous post: Lemon Meringue Fudge! Wow. I tried these out as a tester for my sister in laws baby shower at the weekend and they are truly yummy. A hit with everyone. Only problem was the chips sank on me. I coated them in a bit of the flour beforehand but that didn’t do the trick. Any suggestions? Made these last night ready for a cake sale a school today! (Saved a taster or two of course!) They taste delicious and I’m sure they’ll go down well today! Love your recipes, I’ve tried at least 5 different ones and they’ve all turned out perfectly! Hello 🙂 if i was to make this in to a 3 layer cake, how many times would i times the ingredients by? Three times! Or check out my White Chocolate and pistachio cake recipe, and just leave out the pistachios as that’s three layers! i would just like to ask a question, how come some cakes need baking powder but some do not? Sometimes it’s personal preference – sometimes I like them denser, sometimes lighter! Sometimes something will need it to help, but depends on the recipe! Hey these look amazing! For icing that is too stiff would you recommend milk or boiling water more? Umm I use either to be honest.. but Boiling Water keeps better. You really don’t need much at all though when its a frosting with chocolate in, otherwise, it’ll be quite sloppy! These are yum! I have made them before 🙂 I just wondered how you make your buttercream white? Will this recipe be enough to cook in an 8inch cake tin. Also I don’t have any choc chips can I use grated or chopped up chocolate? They might sink a bit, but chopped up chocolate could work. And yes, it will make one layer. I really want to try these, but I can’t seem to figure out the measurements. I looked on your measurement conversion page but things just aren’t adding up. How many cups is 150g? I don’t know I’m afraid as I work in grams. These look so good!! I’m just wondering about the icing tho. If I leave the melted white chocolate to cool before adding it, won’t it just solidify again? You don’t leave it to solidify, you leave it to cool… Cooled chocolate will still be runny. These look delicious! I’m not the best at baking, but I’ll certainly give these a try. Well I hope you like these if you try them!! The buttercream sounds yum! Can’t wait till I try it.. can I add in colour in the buttercream? Oh wow, those cupcakes really do look heavenly. Your piping is so pretty! I’m a massive white chocolate fan so would easily (and greedily!) 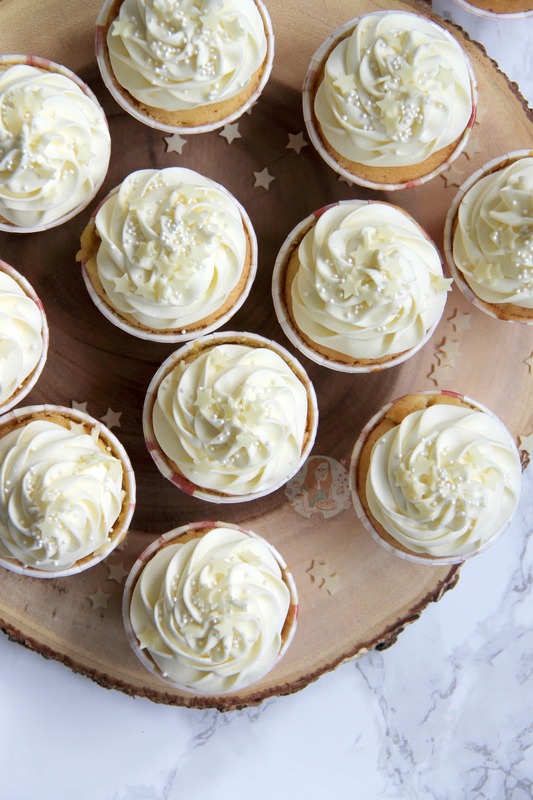 devour a tray load of these cupcakes. Hahah I had to try very hard not to eat them all myself!! Thank you! Hello(again) Where do you get your piping bags from? I either use Savoy Disposable Bags, or Tala small disposable bags! 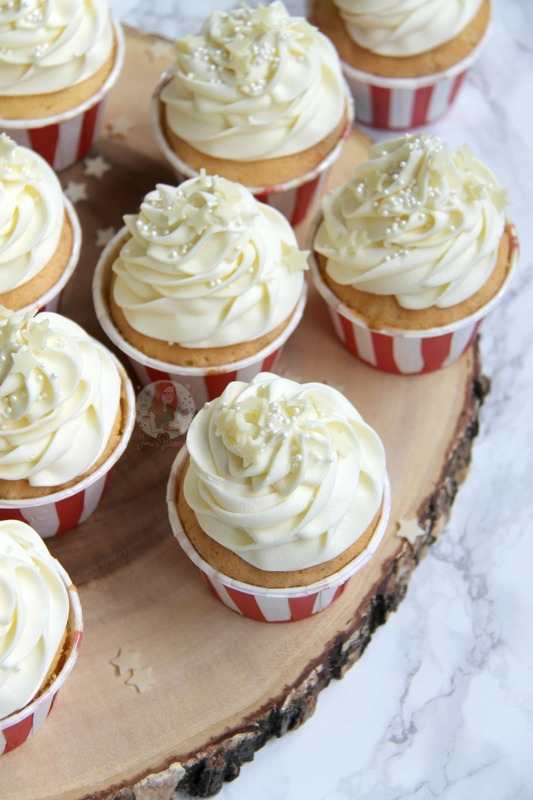 My, My, these cupcakes look mouthwatering! Let me tell you the truth, every baked good looks delicious. I want to try all of your recipes. You have good holiday recipes for me to try, too. I am sure your boyfriend enjoyed those cupcakes. Like that old saying; the way to a man’s heart is through his stomach. I have a blog devoted to writing and reading. Do you know any food books I can write reviews on? My, baking is a lot of fun. Thank you so much! I love so many books I wouldn’t know where to start – I love them all! This recipe looks delicious, and I love the paper liners! I’ll have to check out some of your other recipes, too. Love this will try it!! Awh thank you! I hope you like anything you do make! I only use Free-Range Eggs or Organic – nothing less ? I’m definitely going to try this recipe! already excited to taste them ? Ohhh I hope you love them! !